The Amish Pressed Back Dining Chair is just wood until you order it! Built to order, and shipped immediately upon completion, the Press Back Chair doesn't spend any time waiting and warping in an overheated warehouse. The Amish Press Back Dining Chair is completely handcrafted from oak wood and available in a variety of quality finishes. 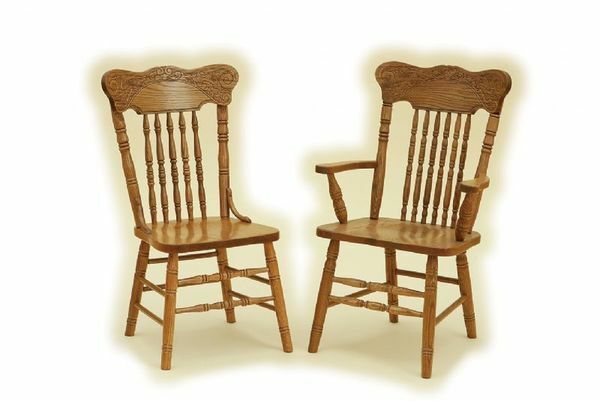 The press back chair is a popular antique design but these chairs are handcrafted in a reproduction style. The etched design appears to be carved but is actually pressed into the wood using a roller which makes these chairs more affordable then carved chairs. The Press Back design is pure elegance and highly detailed, and the stunning turned spindles and legs are each handcrafted with immense patience and skill. This beautiful Dining Chair is available in a variety of quality hardwoods, stains and paints. Call DutchCrafters today with any questions. 1-866-272-6773.